Bittersweet: Leaving Vietnam. My last iced Vietnamese coffee as I sat in the Hanoi Airport. 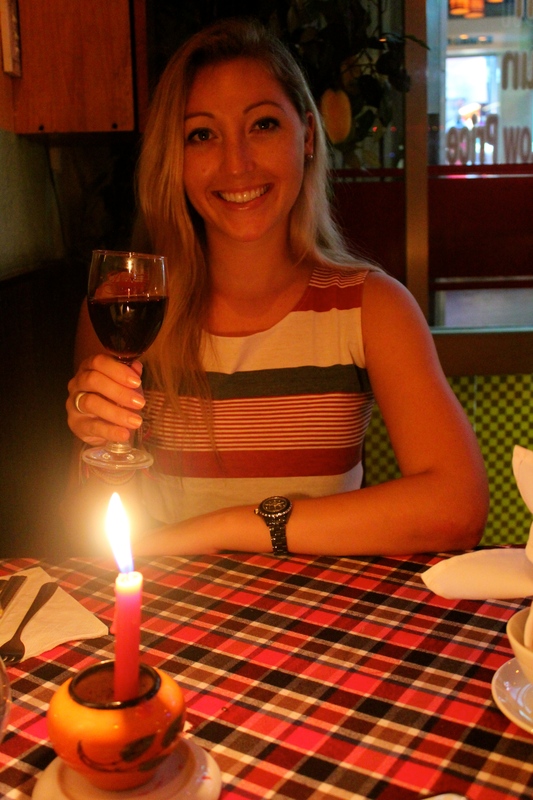 The ways I love Vietnam are many! It’s a country I was looking forward to visiting for sometime, yet I can’t exactly say why; perhaps I had come across something particular during my months of research, or had heard great things from fellow travelers, whatever the reason was, I knew I was excited. 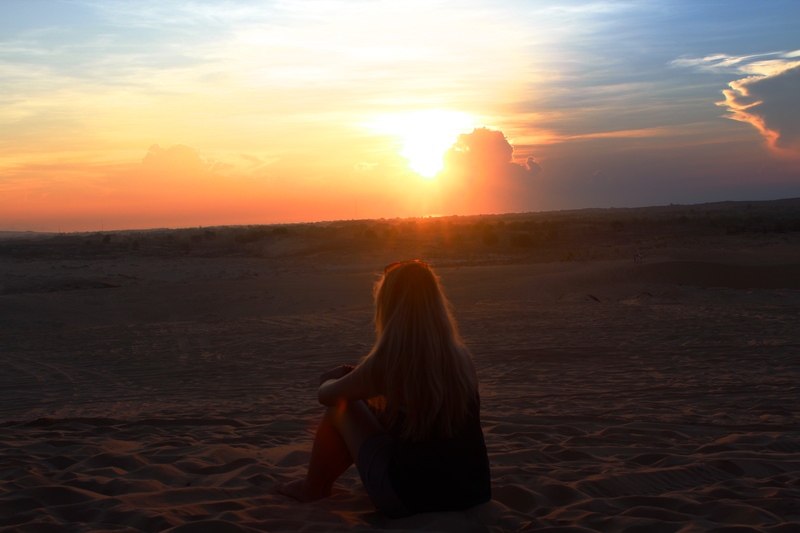 As the days drew nearer to my Vietnam arrival I hoped I had not built my expectations too high to only be met with self-inflicted disappointment. Vietnam did not disappoint. 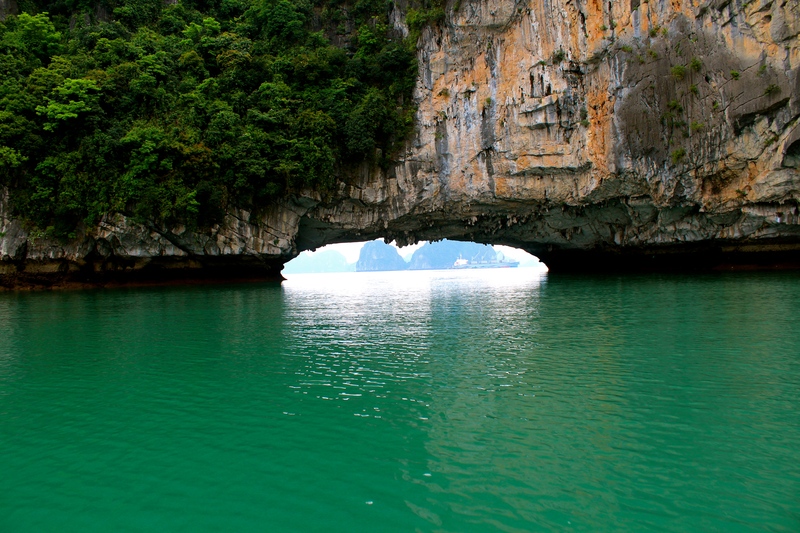 Vietnam was a spectacular experience, and now sits next to Thailand as one of my favorite countries in Southeast Asia. Against the odds, each city I visited I enjoyed; many had warned of people in the North being more aggressive and brash, and even my own experience has proven this feat is a rarity when battling the elements of constant, and tiring travel. 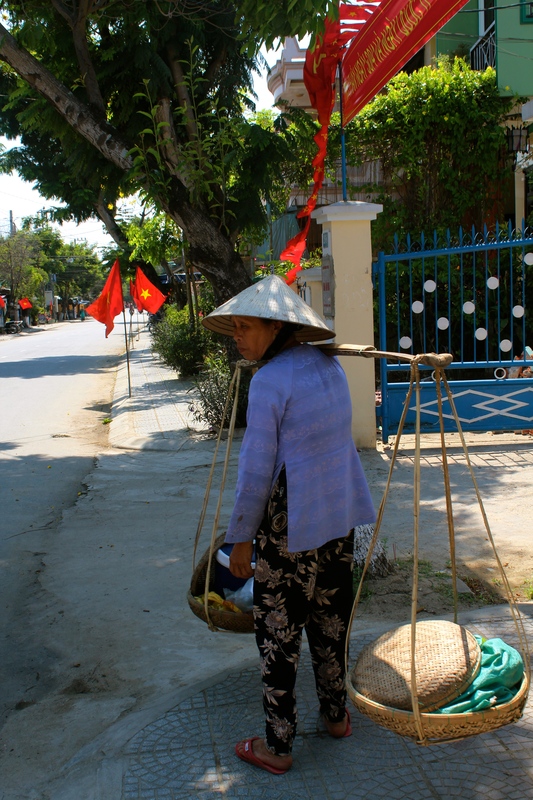 To my surprised delight there were moments of traveling Vietnam that reminded me of home. Cruising among the green forested mountain caps of Dalat, motor biking the coast as rain drops speckled my face, and coffee on every corner; I often imagined I was back in the Pacific Northwest. Yet, there I was in Vietnam. 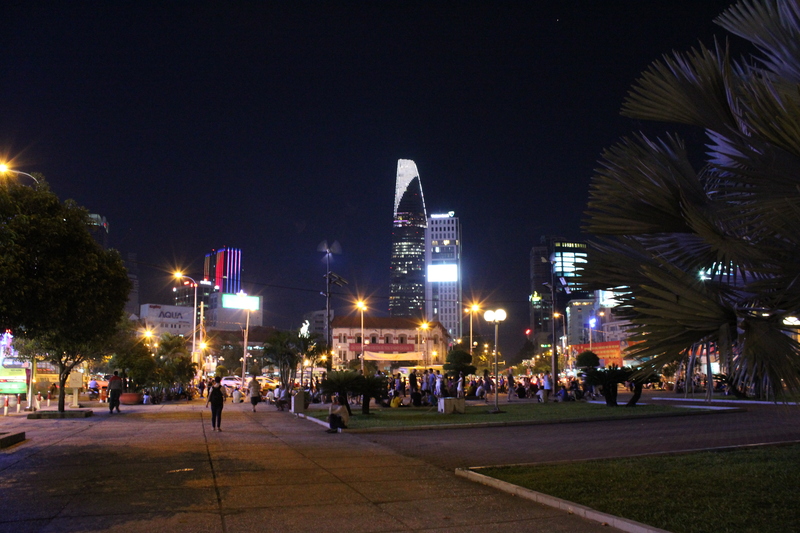 I entered Vietnam from Cambodia, arriving first in Ho Chi Minh, or as locals still refer to it, Saigon. 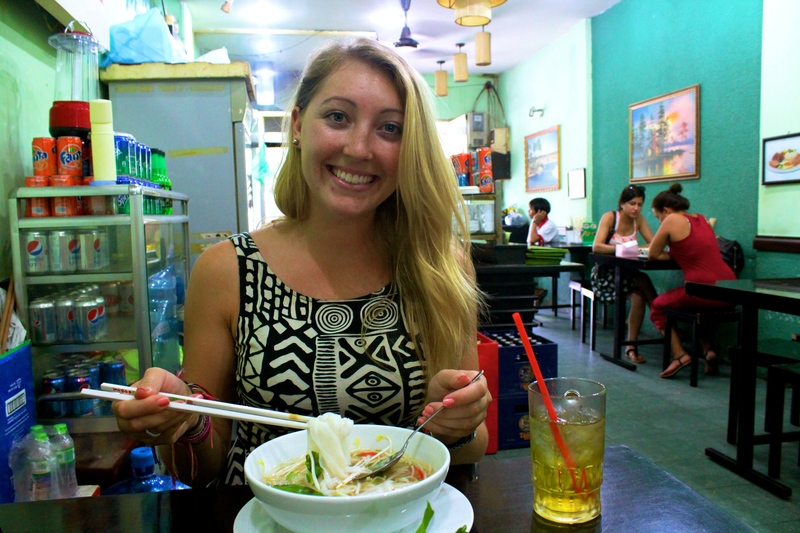 Ho Chi Minh is one of those cities I instantly loved – I was like Goldie Locks, finding the perfect bowl of porridge. The city is not too big and not too small, not too new and not too old, and you can walk most places. 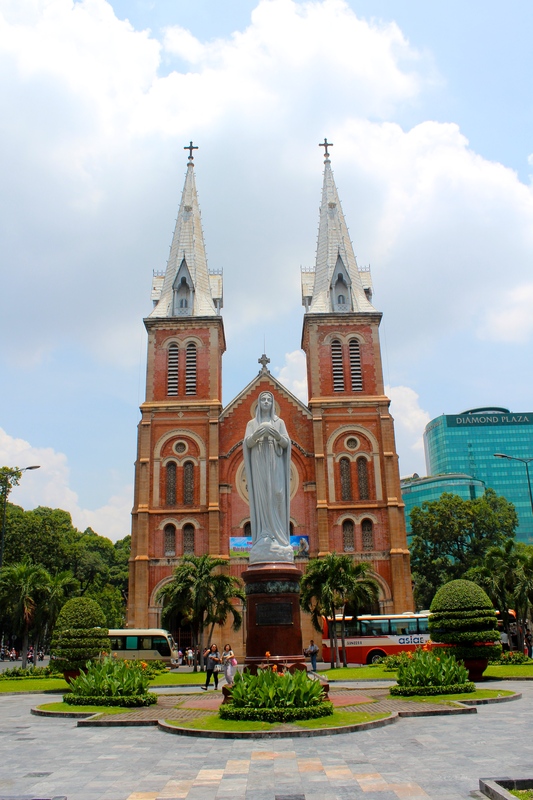 There’s plenty of culture and beautiful French-Colonial architecture to keep your interest with minimal invasion of international chains and merchants. I arrived during the late-afternoon heat so my first exploration was iced-coffee and air-conditioning, and then Wi-Fi to look-up the location of the hostel I had booked in advance. After a nice shower and the typical sorting and organizing of things, I ventured out into the sunset sky. 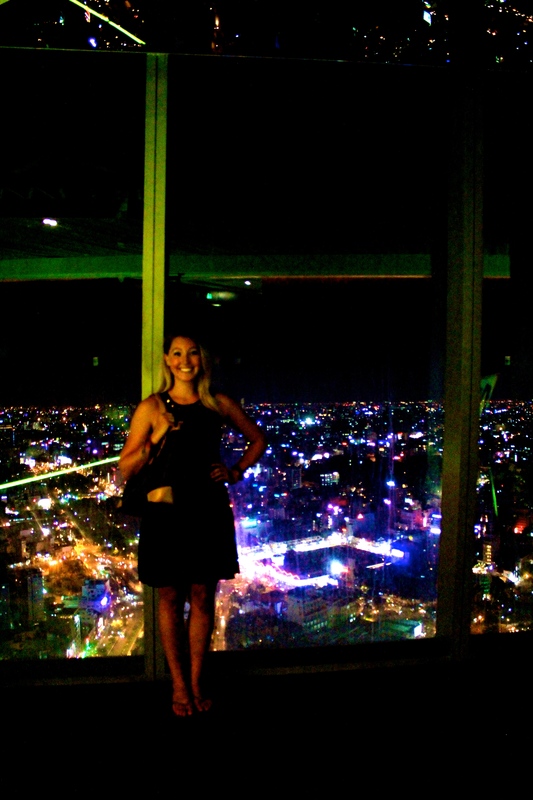 My first visit was the Bitexco Tower to discover Ho Chi Minh from 86 floors up. It was amazing seeing the landscape of the city from above, and views of the many and varied twinkling lights below. From above I planned what to see on ground level, which led me to beautiful buildings and delicious drinks. I landed first in front of City Hall, and then next-door at the Rex Hotel for a famous Five O’Clock Follie. Now, here I was almost 40 years later enjoying the view, live music, and a scrumptious cocktal. On Friday, I took to exploring parts of Vietnam’s recent past, specifically the American War era. 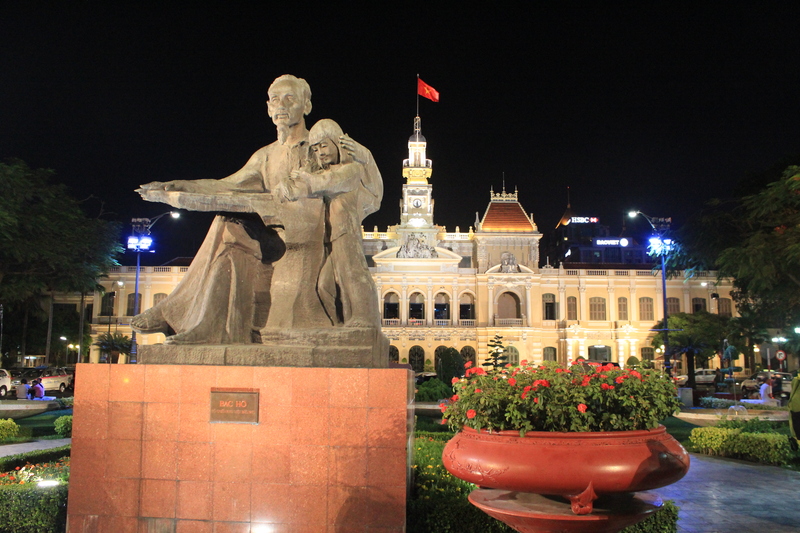 I toured the Cu Chi Minh Tunnels and the War Remnants Museum, an almost full day of sightseeing. 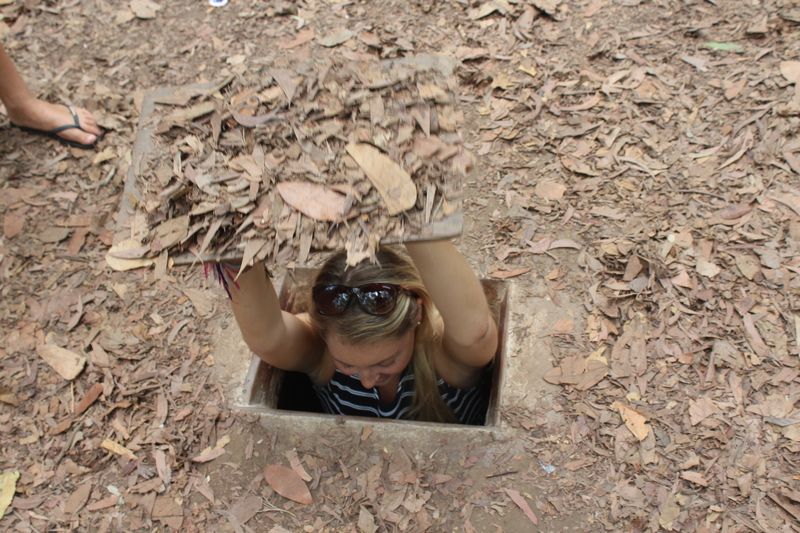 The Cu Chi Tunnels were interesting to see, especially how small of space they really are. I even took a gander into one of the entrances and found that I myself would barely fit through. After the Cu Chi Tunnels, I choose to get off the bus at the War Remnants Museum. Lauren and I met there and entered with a thirst for knowledge. Almost immediately we realized that would not be the case and the museum became less appealing primarily because it was largely propaganda rather than timeline of action, or dare I say ‘facts.’ I had gone there with the hope of gaining a better insight on the war, but instead found it to be very biased. After still exploring every floor briefly we left a bit dismayed. Several weeks later after discussing the museum with an American friend who experienced the same thing, he simply offered the old saying ‘winners write history,’ and Vietnam had won the American War. 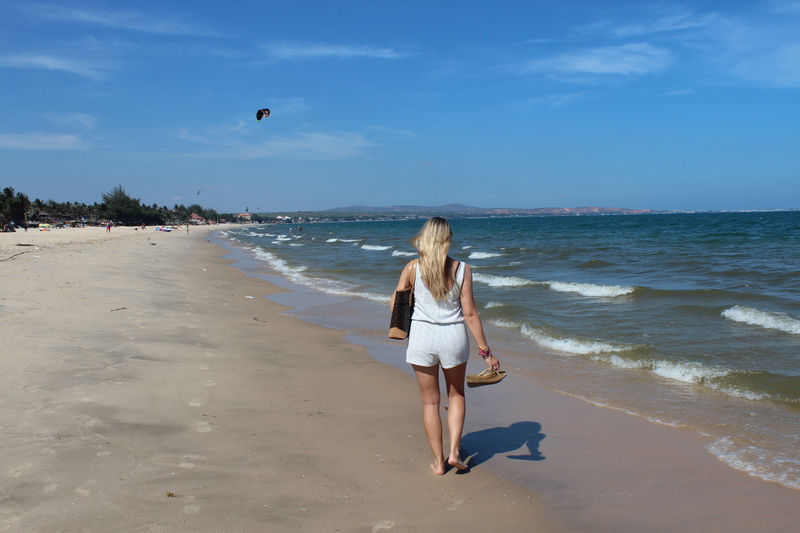 I traveled Vietnam South to North which made Mui Ne the next logical city to visit, and the first shores I would see in Vietnam. Sand dunes, beaches, and a colorful fishing village were the highlights of this small, yet developed coastal town. It also happens to be a popular destination for Russians to holiday, and to that, many things were in Russian as opposed to English. English was still present, but at times it took us a few attempts to find someone who could speak English. 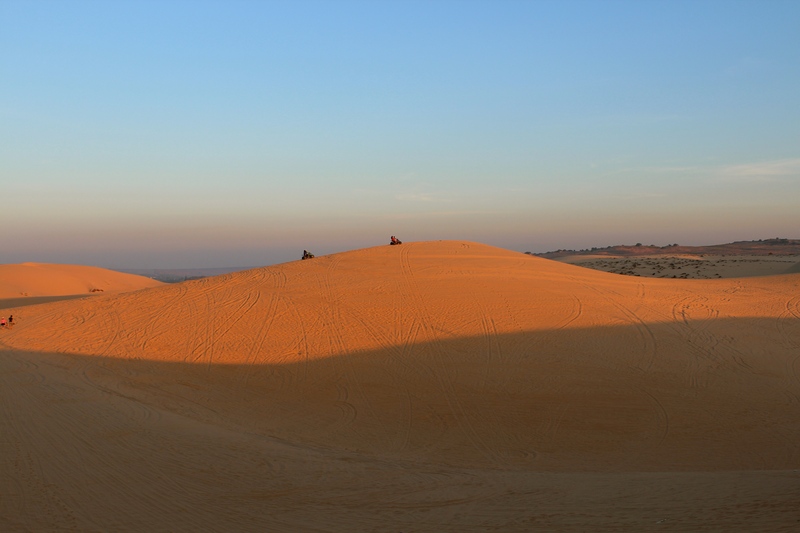 Most memorably and somewhat frustratingly when we were trying to book the 4am tour to the sand dunes for sunrise. We were eventually successful and boy was it worth it. 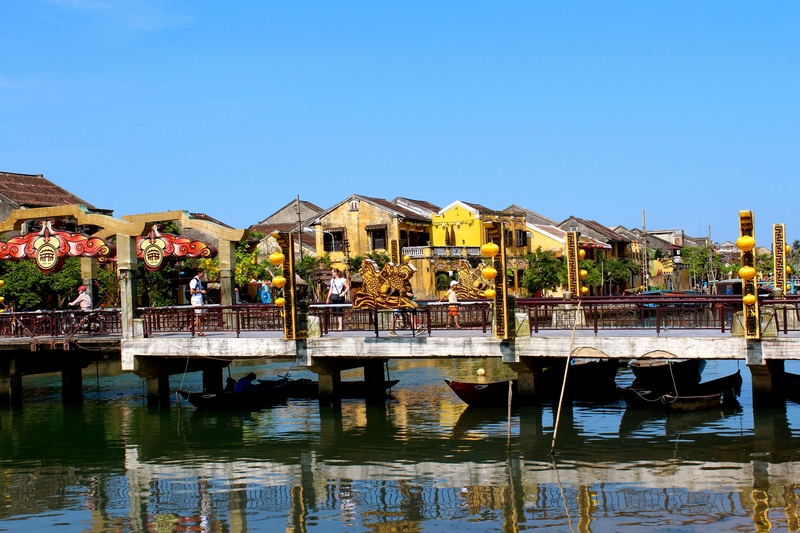 My favorite stop during the morning tour was the fisherman’s village; it’s every travelers and photographers dream – full of color, character, and cheap local foods. 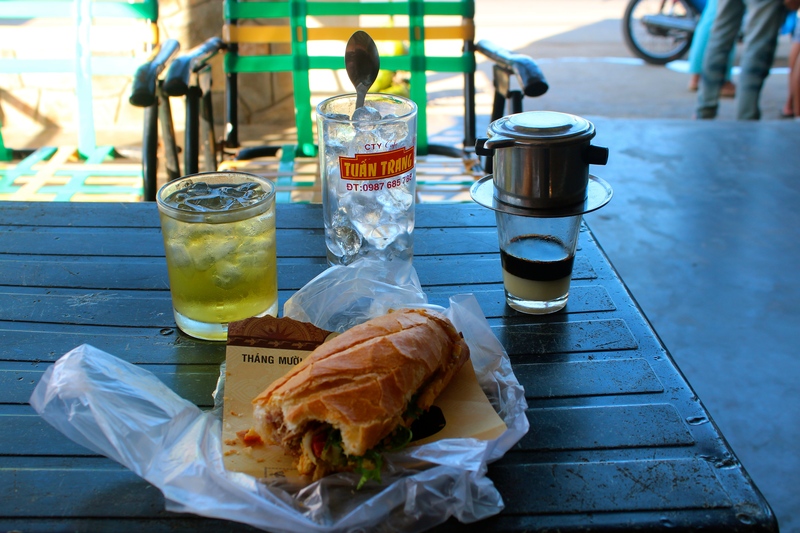 The best breakfast I had in Vietnam was a banh mi sandwich and Vietnamese iced-coffee we enjoyed underneath the front porch of a local family. Banh mi and traditional Vietnamese iced-coffee. 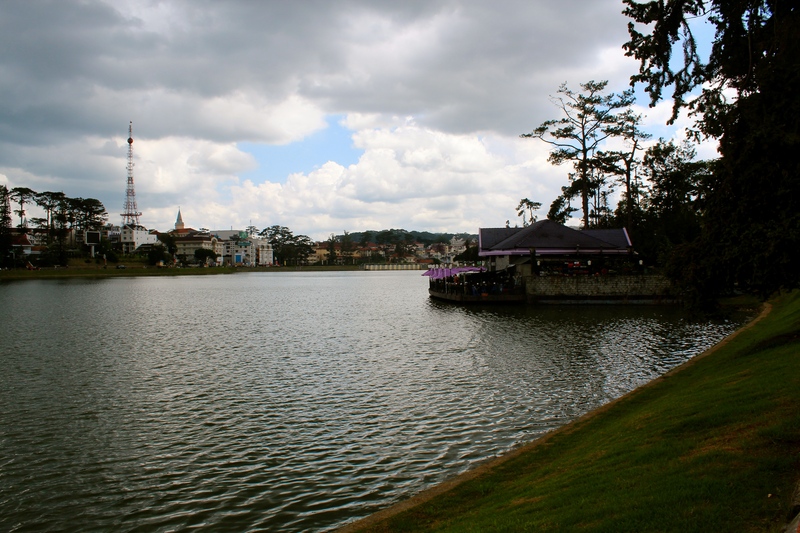 Inland and upwards was our next destination to the smaller city of Dalat. Cooler weather and rainy afternoons meant tea, hot bowls of pho, and delicious iced-coffee. Due to the temperate climate of Dalat we were treated to local staples like dried strawberries, artichoke tea, and my favorite, Dalat Wine; a product of French-era Colonization. We explored the quaint town by cable car, motorbike, and foot whilst enjoying the relaxed atmosphere and sincere hospitality from everyone we encountered. 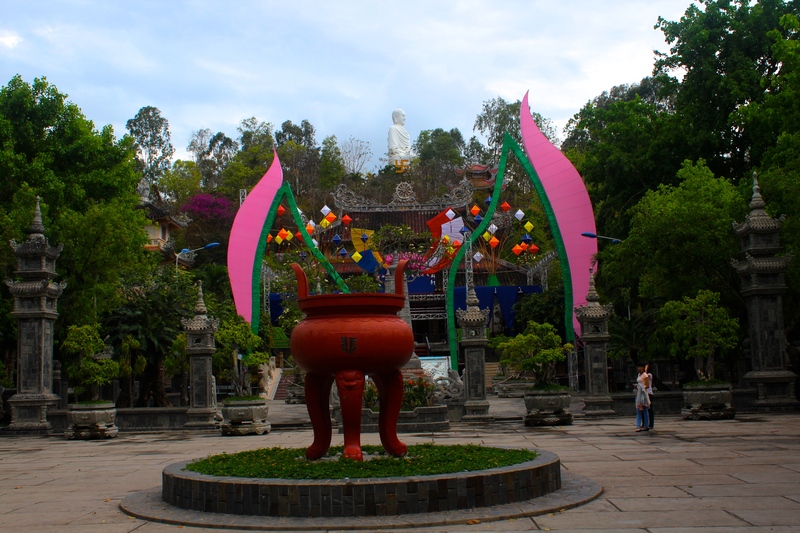 From Dalat we took an early morning bus to Nha Trang and spent a simple day sightseeing. 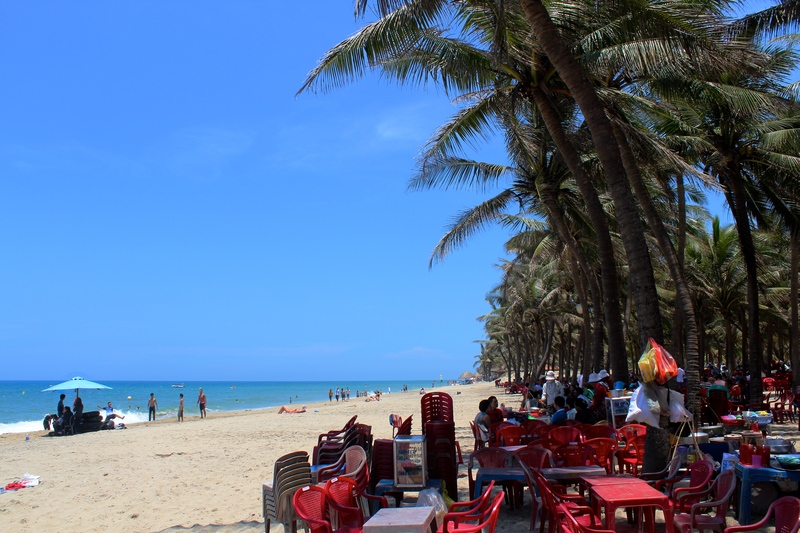 Nha Trang is known for its beaches and its parties. 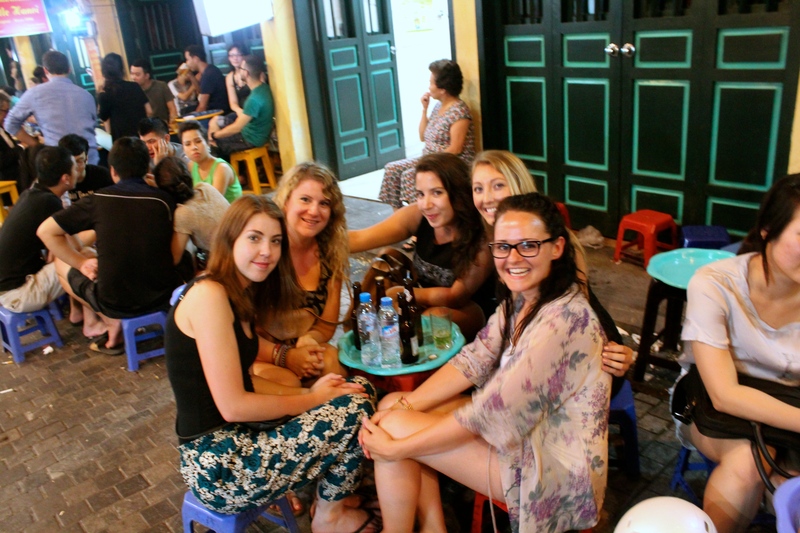 With limited time in Vietnam, rainy weather, and not much of an interest in the party scene, Lauren and I decided we would not need more than a day there. We made the most of it by hiking to see the White Buddha and Long Son Pagoda, enjoyed pho at a monastery, and visited the famous mud baths! 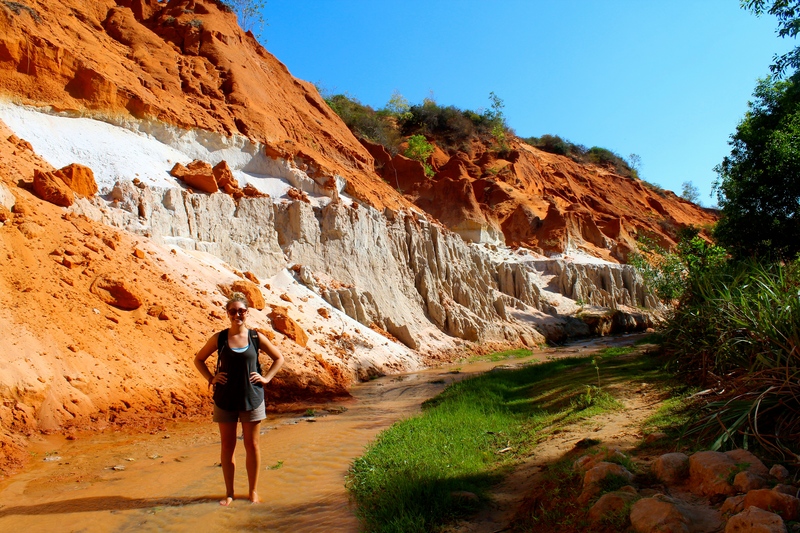 The best way to describe Thap Ba Hot Springs is a spa theme park complete with mud bath tubs, mineral water hot pools, and many people. It was a very fun, different, and recommendable experience. 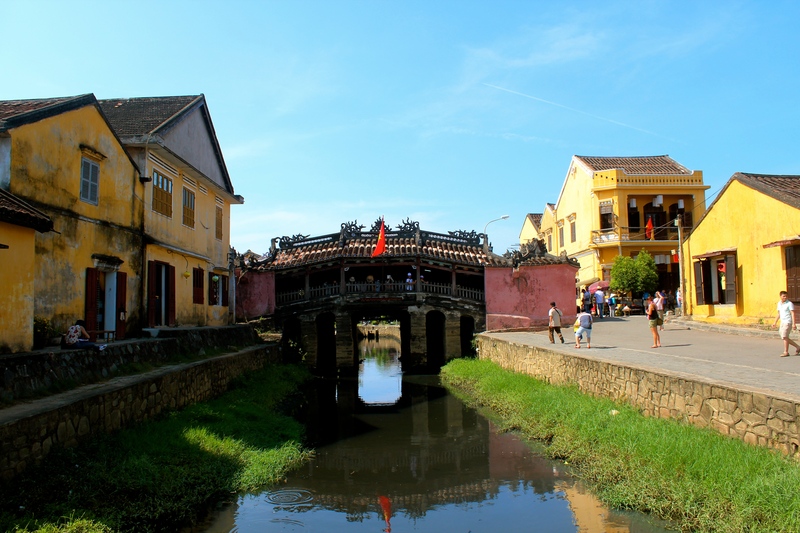 With our mud induced soft, glowing skin we made our way to the train terminal and set our sights on Hoi An, and what a lovely site it is. We had booked an overnight train earlier that day and were lucky to get on it. As it was the Vietnamese Independence holiday travel bookings were more expensive and less available. We insisted our way onto the train from Nha Trang and grabbed two ‘hard seats,’ as they are called, and apparently not normally sold to foreigners. Eleven hours overnight on a wooden bench proved to not be too intolerable since the car was not entirely full, allowing us to make ourselves semi-comfortable by laying across the benches rather than sitting. 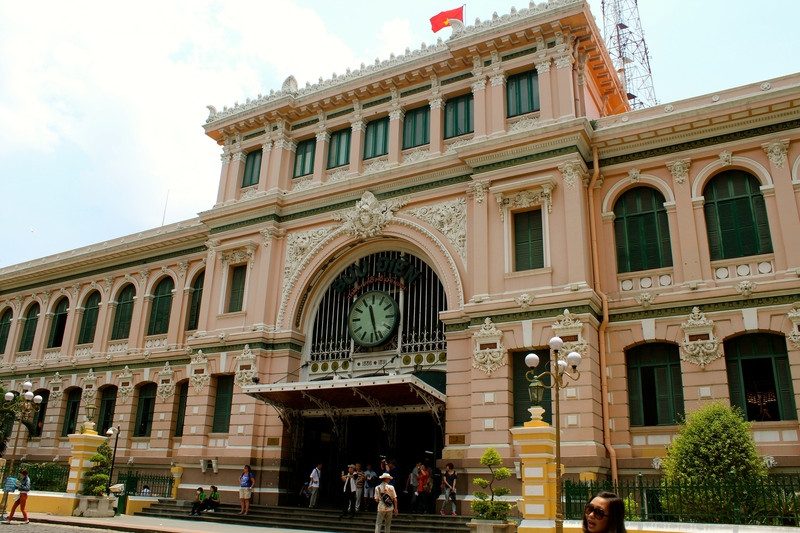 The train arrived in Danang around 8am, the city you must depart at because the tracks do not cover the ground to Hoi An. After an iced-coffee (seeing a theme?) we walked around aimlessly to find a motorbike to rent as a taxi to Hoi An was an outrageous 400,000 dong for one way, equivalent to $20. Finding no motorbike rental shops we stumbled upon a motorbike taxi on a corner and asked if we could rent his bike. He was immediately up for it and we agreed on a price of 200,000 dong, which was fantastic! The only problem was that his bike was a manual and Lauren can only drive an automatic. No problem he said and took Lauren to his sister’s house to use her automatic bike instead. Sometimes persistency pays off, and this time it got us a great deal and the freedom to drive where we wished, at the times we wished, and the chance for an excellent adventure. 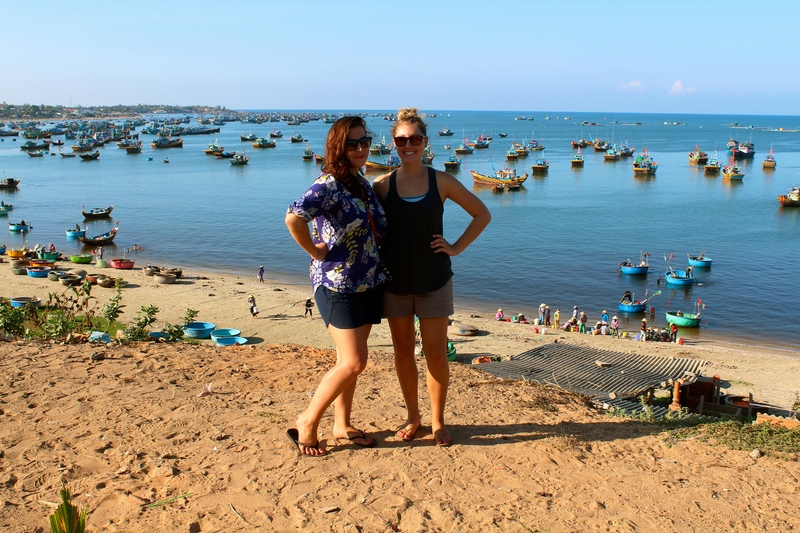 We drove the coastline thirty kilometers to Hoi An and it was just as you would imagine; white sands, blue waters, and the wind in your hair. We lunched with the locals along the sea and then drove to the city center to walk the picture-ready French Quarter. 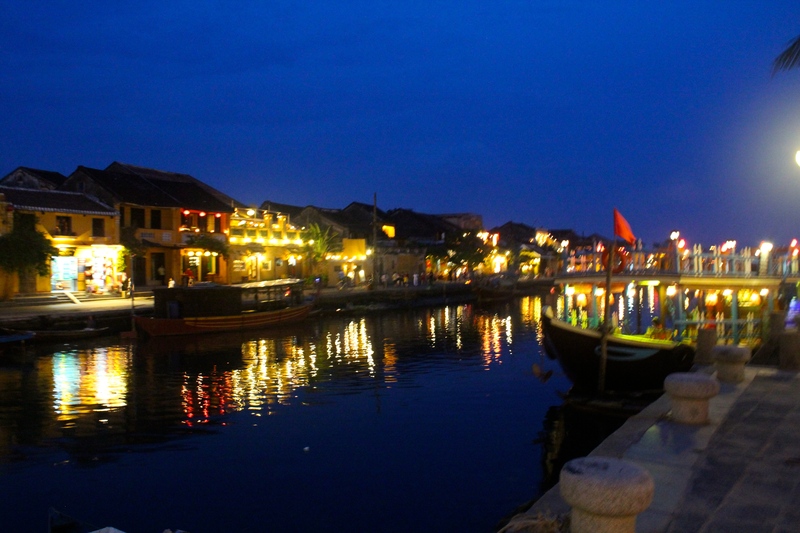 Late afternoon turned to early evening, and sadly our time in Hoi An had come to an end. We started our drive back to Danang after getting directions from locals on the side of the road. We then proceeded to successfully maneuver traffic in the dark, and a rainstorm for the last ten kilometers of our return to Danang. Once in the city, we lost our way and I had to run into an electronics store to ask for help. The sole English-speaking employee in the store politely helped us and called the man we had rented the bike from to notify him of our tardiness; she then gave us directions to the train station which turned out to not be too far, but we would have never found it ourselves. Pulling into the train station we were joyous and exhausted, and happy to return the bike over to its owner. Fortunately for this train ride we had been able to procure two beds in a sleeper car. 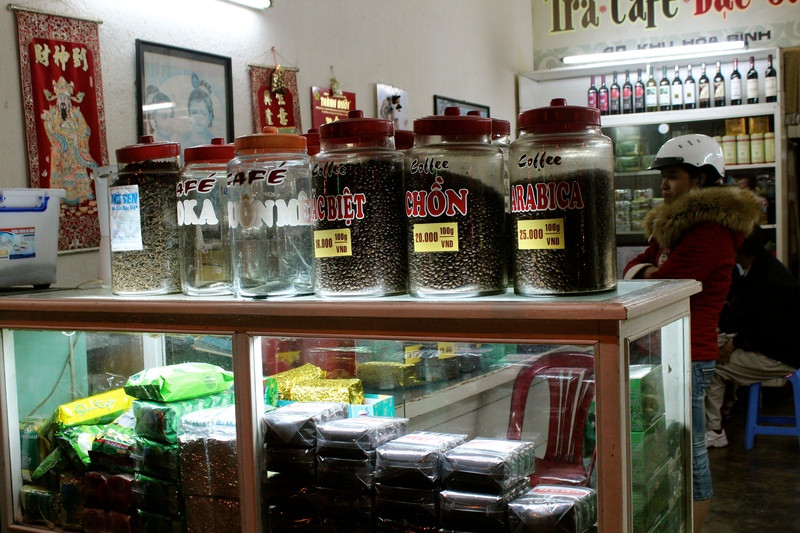 They proved to be infinitely necessary on the fifteen-hour ride we endured to Hanoi, the nations capital. Hanoi was lively and bright with color, tuk-tuk drivers, food stands, and souvenir shops.We had five days left in Vietnam and two destinations we wanted to visit; Sapa and Halong Bay, two very famous sites. 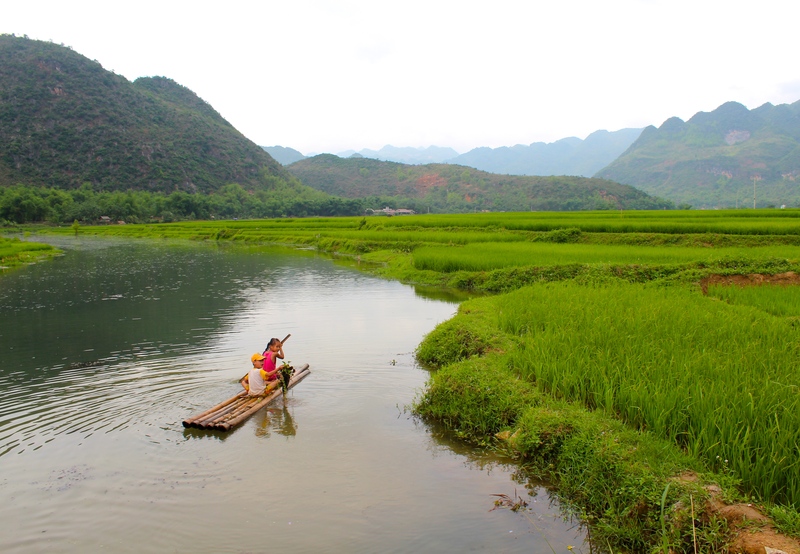 Instead of the 10-hour journey to Sapa we choose the much closer and less populated Mai Chau, and two days after an equally long trip to Halong Bay. Our hotel’s concierge helped us with this decision and booked fabulous tour companies for both journeys. 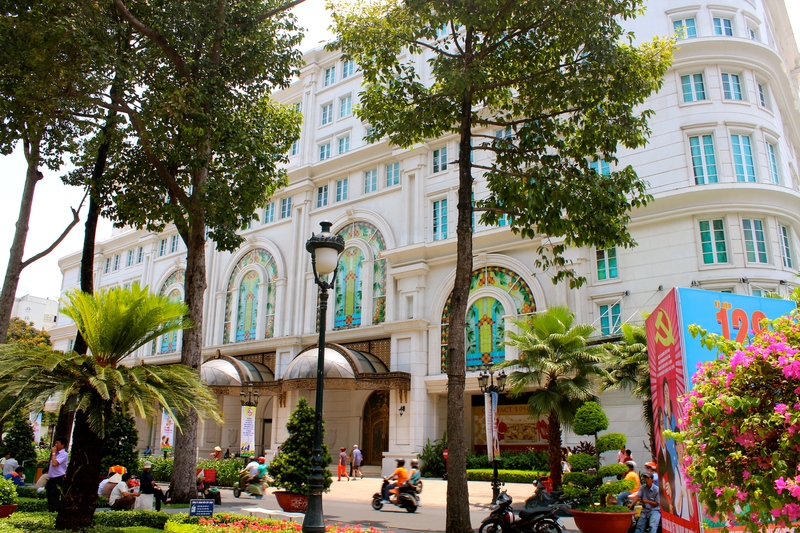 Hotels and hostels in Hanoi are very accommodating for these sorts of trips as most travelers are in Northern Vietnam to see these three cities. They allow you to leave your enormous backpacker bag with them in free storage while you take the two-day, one-night, or longer expeditions. When you dont’ have to lug around all of your baggage it is truly a godsend. 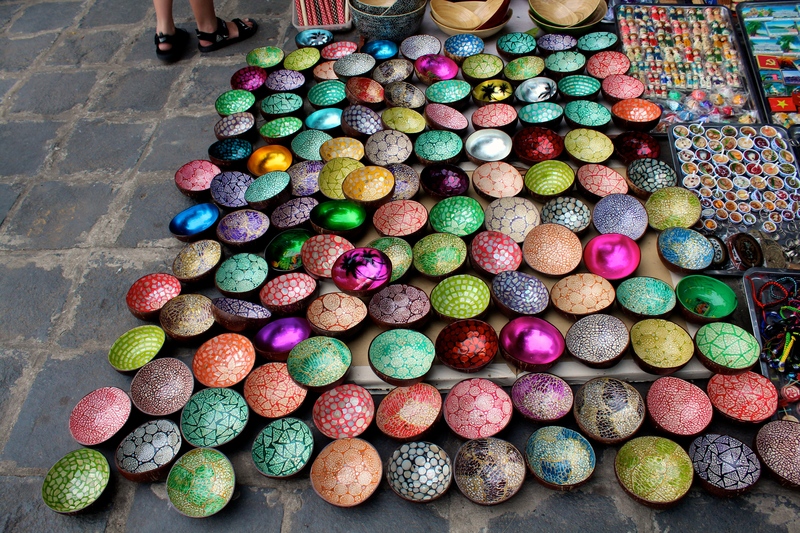 Colorful bowls made from coconut shells. Mai Chau was a nice two-day adventure in the small village, which ironically is populated with Thai people who migrated decades ago. Leave it to Lauren and I to find the Thai people in Vietnam. 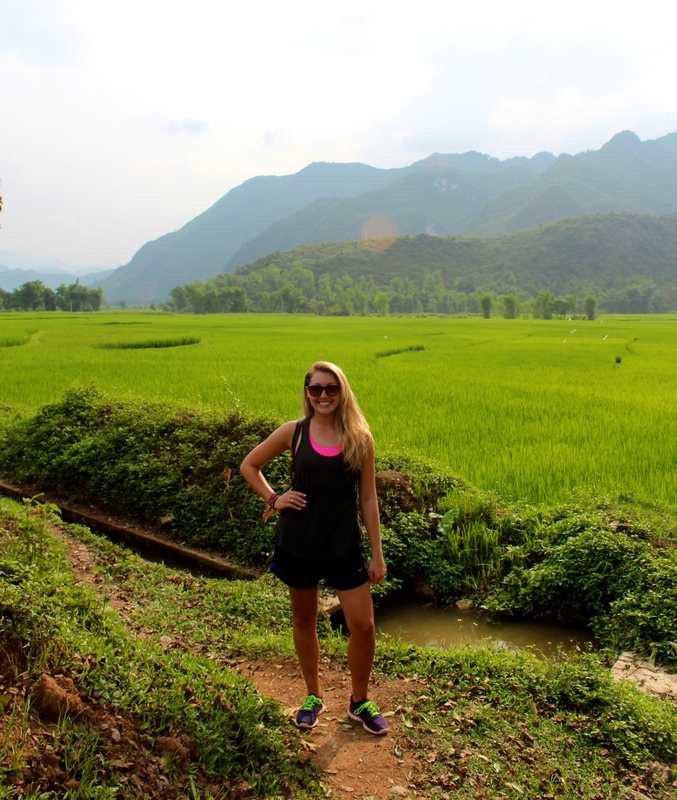 We biked and hiked rice paddies lush with green, enjoyed traditional dance in the evening, and slept under mosquito nets at night. It was nice retreat to the low-key and kind-hearted people, and our guide was amazing. Most enjoyable was the small group of people we shared the experience with and the slow nature of everything around us. 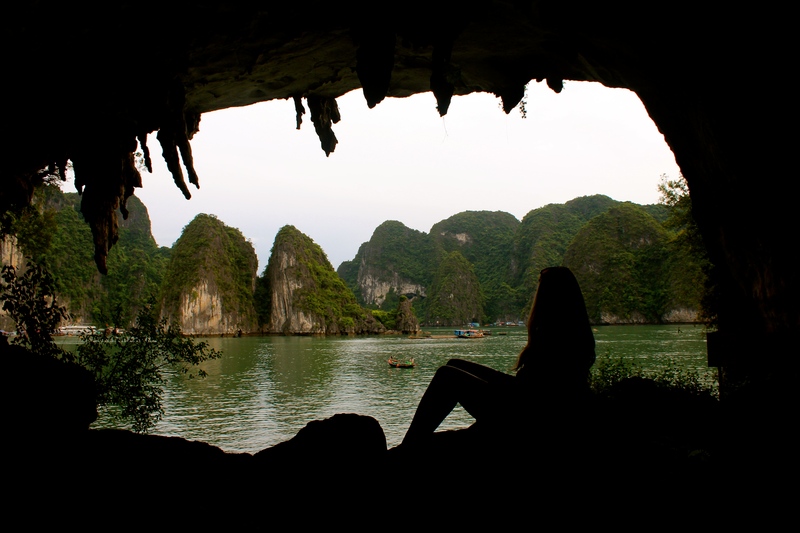 After a twelve-hour sleep back in Hanoi we were again on a three-hour bus to Halong Bay. 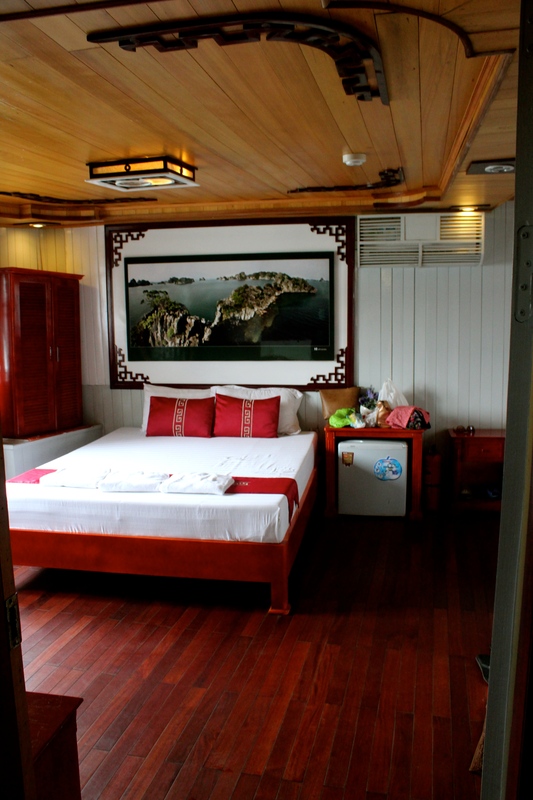 We spent a little more money to be on a three-star boat instead of a party boat, which unquestioningly would have been more dirty and smelly, and you run the risk of having to pay extra fees for any activities you want to do. Our boat turned out to be beautiful and wonderfully staffed. We enjoyed overcast, yet beautiful views of the bay and its many rocky mountains; they were endless. 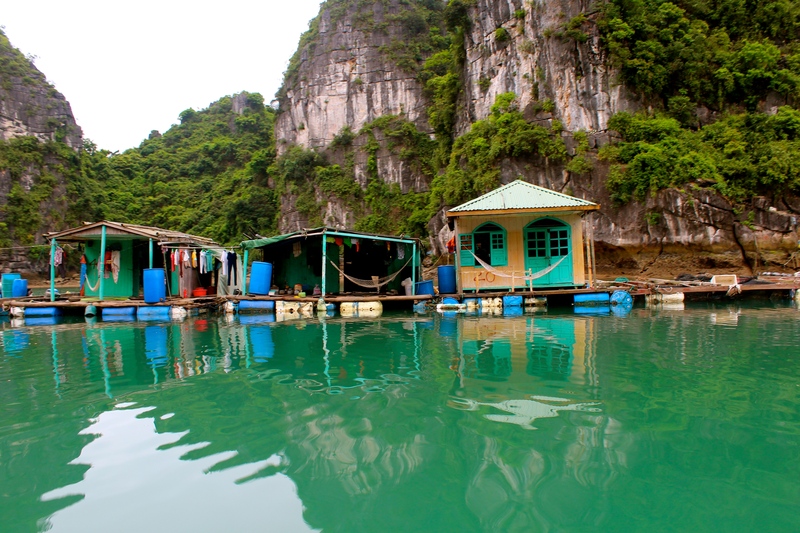 The area is populated by small fishing villages whose inhabitants live on the water in small, floating homes. We took in the views from the roof-deck and kayaks, and thoroughly enjoyed our stay on the boat, especially as we were somehow given the biggest room on the boat! We could have had a party in it. Our last journey back to Hanoi left Lauren with one last night in Vietnam, and myself two nights. 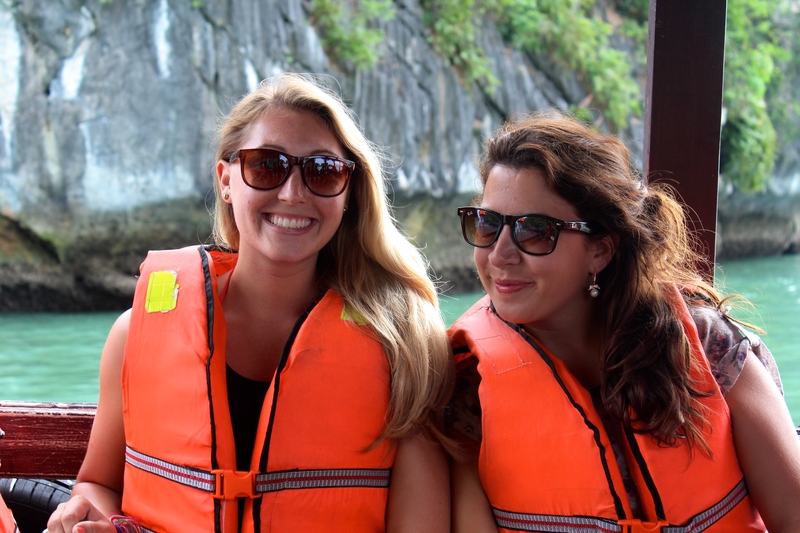 We did what everybody does in Vietnam, and had custom tailored clothes made. Lauren had a beautiful dress made for her birthday later that week in Bangkok and I had a few professional pieces made that I could wear for work or teaching. 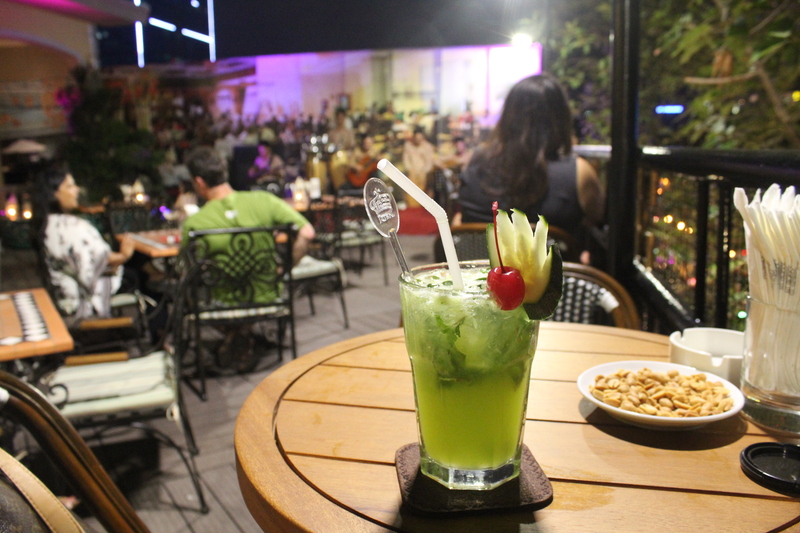 We wandered beer street, infamous for it’s 5,000 dong beers, 25 cents, and enjoyed a coffee above the lake. After Lauren left the next morning I took to the streets once again and made sure to see one of the daily showings the Thang Long Water Puppetry Theater performs. It was a superb hour long dance of puppets and live music played by a small ensemble with ancient musical instruments. I took a walk around the lake, enjoyed last-minute souvenir shopping, and a final meal at what turned out to be my favorite place for Vietnamese food. Vietnam will always be a country I want to visit again and again. When I first arrived I immediately thought I could picture myself living there, and that thought hasn’t quite left my mind yet. Like always, only time will tell. 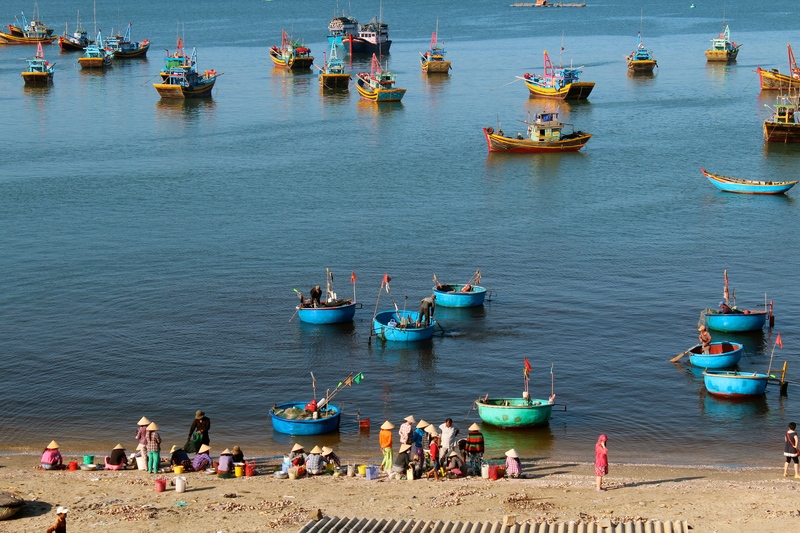 Nice to read your impressions of Viet Nam. I’d like to offer another view of the war and the war museum. Remember that after the war Viet Nam closed it’s doors for ten years. In many respects, such as museum displays it’s behind other countries. You could say it’s biased, but they probably didn’t intend it that way. I get this sense because when you chat with Vietnamese people they’re over the war, they don’t want to talk about it. They’re very future focused. Oh, and they love the US. Most aspire to visit, if not live there. Also, if your country had been bombed for 53 or 54 days straight, morning noon and night, you’d want to portray how tough this was. I’m a Kiwi, and we made Agent Orange in New Plymouth, New Zealand, and supported the US during this war, but I don’t feel this museum was biased. If anything, I felt physically ill because of the bad vibes. 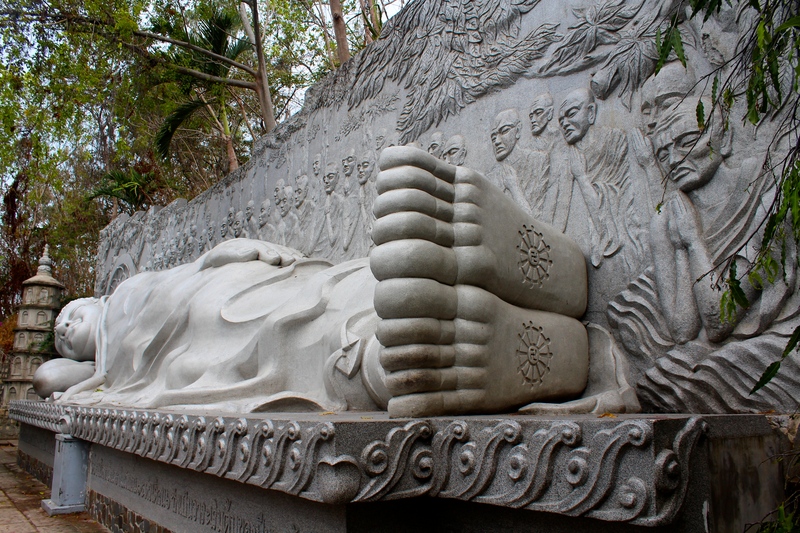 I felt it was an important part of Viet Nam’s history to try and understand. Another aspect of the war that you may not know, is that it wasn’t purely about politics or geographical boundaries. Vietnamese people were on the side that protected them and didn’t kill them. Many families were split because of this, but not by choice. To counter this they would speak daily telling each other where the next day’s patrols would be. Horrible things happened to Vietnamese who worked for the Americans during the war. All were imprisoned for lengthy periods immediately after. Many Vietnamese are bitter towards their own government because of what they’ve suffered, particularly refugees now living all over the world. This blog post is really good. I love your photographs. It looks like you had a wonderful experience. Come back soon! Thank you for your comment, it’s good to hear more about the conditions and circumstances around the war, and specifically people affected. I completely agree that the Vietnamese love Americans (and other nationalities), I was always welcomed with a warm gesture everywhere I went. It one of the reasons it made my travels there so enjoyable. I hope to visit again! !